Silver Spring, Md. (Tuesday, April 2, 2019) – Boeing and Discovery Education, the leading provider of standards-aligned digital curriculum resources, engaging content, and professional learning for K-12 classrooms, today launched FUTURE U., a new innovative initiative to train the next generation of STEM professionals in aerospace exploration. The program will provide students with digitally immersive curriculum resources and experiences, including hands-on STEM activities, to help 6-12th grade students embrace their potential to make an impact on the future of aerospace. The FUTURE U. program’s inaugural activation, Innovating the Future Virtual Field Trip, will premiere on April 9, 2019 at 1 p.m. ET/10 a.m. PT and will transport students from inside the walls of their classrooms to Johnson Space Center in Houston, Texas where they will virtually engage with Boeing professionals who are writing the next chapter of human history in space. During the Virtual Field Trip, students will discover how these innovators employ various technologies like Extended Reality (XR) to prepare for the launch of the Starliner/CST-100 spacecraft and deployment of the Space Launch System (SLS). Educators, parents and students are welcomed to register for the virtual event. 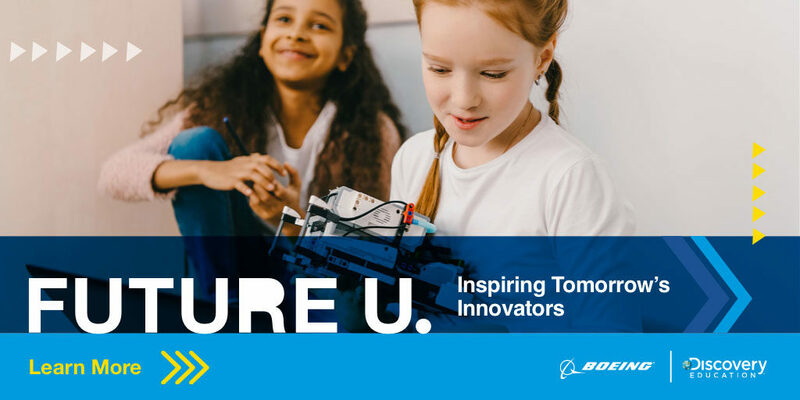 Participants are encouraged to join @DiscoveryEd, @Boeing and other experts for a live Twitter chat during the premiere by submitting questions and sending pictures using #BoeingFUTUREU and #BoeingInspires. FUTURE U. resources are available at no-cost at boeingfutureu.com and within Discovery Education Streaming Plus, an award-winning comprehensive digital service supplementing instruction across all K-12 curricular areas. Discovery Education Streaming Plus empowers educators to create dynamic learning environments that mirror students’ use of technology outside the classroom. This initiative also helps students explore aerospace technology through Virtual Field Trips, 360° videos, engagement of youth by Boeing employees, and hands-on standards-aligned STEM lessons guided by Next Generation Science Standards (NGSS), Common Core State Standards for Mathematics (CCSS: Math), and Common Core State Standards for English Language Arts (CCSS: ELA). FUTURE U. provides educators with the tools they need to inspire their students to use Discovery Education’s four C’s – Communication, Collaboration, Creativity and Critical Thinking – to embrace their potential and innovate for the future. FUTURE U. will connect young learners to digitally immersive STEM experiences that are designed to spark their curiosity and give them the confidence to seek out solutions that have the potential to positively impact the world. FUTURE U. resources are accessible for free at boeingfutureu.com and will be integrated into Discovery Education Streaming. For more information about Discovery Education’s digital content and professional development services, visit discoveryeducation.com. Stay connected with Discovery Education through social media on Facebook, Twitter, Instagram and Pinterest @DiscoveryEd. Boeing is the world’s largest aerospace company and leading manufacturer of commercial airplanes, defense, space and security systems. As the top U.S. exporter, the company supports commercial and government customers in more than 150 countries. Boeing employs more than 150,000 people worldwide and leverages the talents of a global supplier base. Building on a legacy of aerospace leadership, Boeing continues to lead in technology and innovation, deliver for its customers and invest in its people and future growth. As the global leader in standards-based digital curriculum and content for K-12 classrooms worldwide, Discovery Education is transforming teaching and learning with award-winning digital textbooks, multimedia content and the largest professional learning community of its kind. Serving more than 5 million educators and 51 million students, Discovery Education’s services are available in approximately half of U.S. classrooms and primary schools in the U.K., and more than 90 countries around the globe. Inspired by the global media company Discovery, Inc., Discovery Education partners with districts, states, and like-minded organizations to captivate students, empower teachers, and transform classrooms with customized solutions that increase academic achievement. Explore the future of education at DiscoveryEducation.com.